Out of all of the city labor units, only Unit 4, (police), are currently at impasse with the city. There are two major reasons for this: 1. The contract that PLEA negotiated with the city almost two years ago stipulated an agreement for 3.2% in TEMPORARY wage and benefits concessions with the agreement that said concessions would be restored at the end of the contract cycle. 2. The city’s own independent pay and compensation study done by the Segal group at a cost to taxpayers of almost a half million dollars which indicated that Phoenix police officers are currently paid at 98% of market rate. It should be noted that 100% of market is the 50% level or the median pay average. 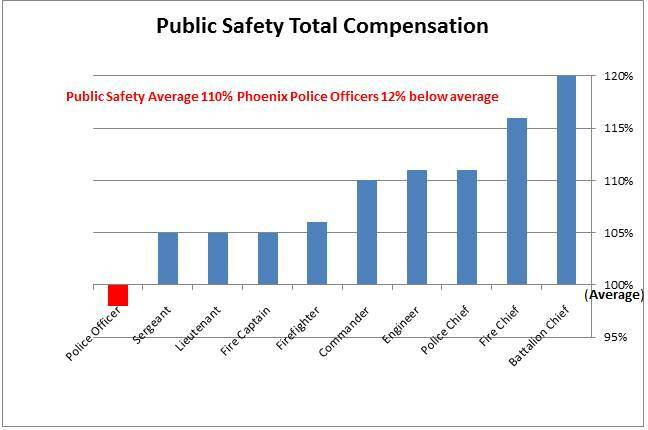 Firefighters, by comparison, are compensated at 106% of market which indicates they are paid 6% above average. For years the city has lumped police and fire together under the umbrella of public safety and has stated we should be compensated equally. If this is in fact true, perhaps police could be raised up to 106% of market rate to be brought more in line with the fire department. To this end, PLEA has asked the city to restore the 3.2% in temporary concessions the first year of the contract and for a 4% pay increase in year two of the contract. Mr. DiCiccio is fond of parsing words and spinning the numbers when it comes to blasting the police. The two videos below will give context and perhaps jog Mr. DiCiccio’s memory about past statements he has made with regard to police compensation. At a city council meeting on Feb 7, 2012, he stated that police are under compensated, yet in a recent channel 5 news interview on March 28, 2012, he states that city employees should forego “raises.” PLEA believes that the city should honor its written contract with its officers. Giving someone back what is owed is not a raise. The pay chart graphic below shows how police stack up with the rest of public safety.